Old map by ANTIPHONAL -A gigantic Antiphoner in massive contemporary binding. If this page still shows after 15 seconds, click here. We guarantee the authenticity of this item. This item is not available or sold. Title: A gigantic Antiphoner in massive contemporary binding. Size: 30.3 x 20.9 inches. Condition: Elephant folio. (770 x 530mm.) 70 leaves of manuscript on vellum. Contemporary brown leather over wooden boards, brass corners and studs, 1 brass clasp (with 1 missing). Over 150 large decorative initials. Several pages unfortunately no longer present. A gigantic Antiphoner, it is certainly the biggest of these vast choir books we have handled for many years. MASSIVE CONTEMPORARY BINDING of wooden boards covered with brown leather, brass corners and studs, 1 brass clasp (with 1 missing). 70 Leaves each with five lines of text written in a huge rounded gothic hand and of music on a 5-line red stave, rubrics in red, over 150 large decorative initials and numerous small initials in red and blue. Extra shipping costs apply due to its size and weight. NOTE : The Reserve prices are disclosed 24 hours before closing in My BidPage / Auction Watch. Check here closing time for your time zone. - Items who do not reach their reserve are no longer available after the closing. - Outbid notification and image Zoomify will be disabled 30 minutes prior to the auction closing ! - You may place a new bid at the suggested minimum bid increment, or any higher amount in which case the Proxy Bid function will raise your bids with the minimum increase necessary to win the bidding (up to your maximum bid). In order to place bids you must register with us. It is free, and we automatically update you about future auctions. Bids are placed in the bidding table on this page or from My Bid Page / Auction Watch. The bidding table shows the mininimum bid, high and low estimate and the time left before the auction closes. The highest bid received after closing wins!. You may place a bid by entering any amount equal or higher than the starting bid or the minimum bid indicated on the bid page. You may place a new bid at the suggested minimum bid increment, or any higher amount in which case the Proxy Bid function will raise your bids with the minimum increase necessary to win the bidding (up to your maximum bid). Note : Outbid notification and zoom image are disabled 30 minutes prior to the auction closing ! Place your bids now, auction is closing sooner than you think !. The buyer pays, on top of the hammer price, a premium of 15% on the first $30,000 and 10% on the excess. The invoice will be available 2 hours after the closing. At no additional charge, Paulus Swaen allows you to put your shipping on hold. This can be incredibly convenient for people who want to buy several items at different auctions and ship them together. The service is free and you pay only one shipment fee. We warranty the authenticity of each old map, print, atlas, medieval manuscript described in this catalogue. There is no time limitation to this garantuee. -Any lot differing from the catalogue description may be returned for a full refund. 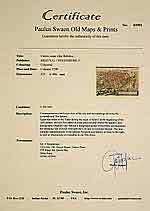 - A certificate of authenticity is provided for each acquired antique map, print, medieval manuscript. The certificate can be downloaded from your invoice page. For more details about how this auction works, click here. Many answers are also likely to find in help section: . is the first internet auction specializing in old maps, Medieval manuscripts and prints. It is a unique place for buying and selling antique maps, atlases, books, and medieval manuscripts. We are in the map business for 40 years!